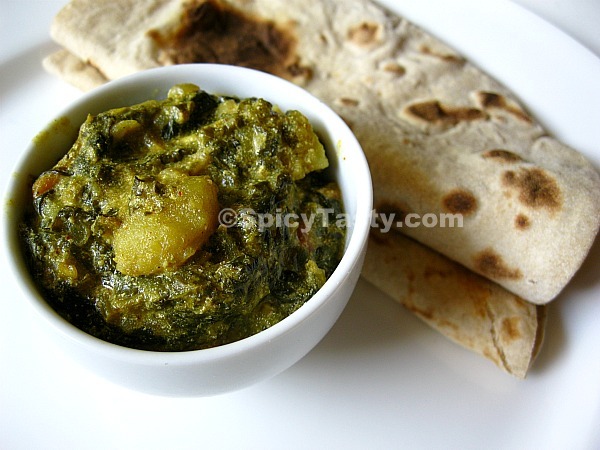 Sarson Da Saag is a traditional and popular dish in Punjab which is served along with Makki Di Roti. 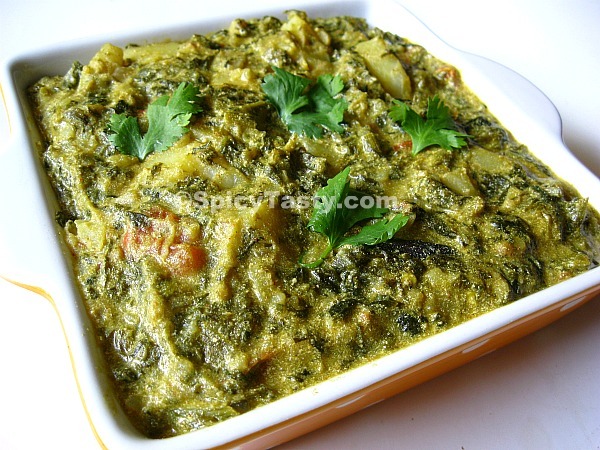 Sarson Da Saag is a curry made from mustard greens and spices. Makki Di Roti is a flat bread made from corn flour. This curry can also be served with naan or roti or other flat breads. Nutrition and you says: Mustard greens is one of the nutritious green leafy vegetables. They are very low in calories and fats but rich in dietary fiber. Fresh mustard greens are an excellent source of several vital anti-oxidants and minerals like vitamin C, vitamin A, vitamin E. Regular consumption of mustard greens in the diet is known to prevent arthritis, osteoporosis, iron deficiency anaemia and believed to protect from cardiovascular diseases, asthma and colon and prostate cancers. I used pressure cooker for cooking this dish. If you do not have a pressure cooker, you can use any pan with a tight lid. Soak cashew nuts and poppy seeds in warm water for 15 minutes. Heat a tbsp of oil and ghee in a pressure cooker and add bay leaf, cinnamon stick, ground cardamom and cloves. Fry for a minute and then add chopped onions and a little salt. Fry till it becomes translucent. Add chopped ginger and garlic followed by slit green chilies. Fry for a couple of minutes and add chopped tomatoes. Let it cook for 3 minutes. Keep stirring occasionally to avoid sticking at the bottom. Add turmeric powder, red chili powder, cumin and coriander powder, garam masala, amchur powder and kasuri methi and a little water. Cook for 3 to 4 minutes and add chopped mustard greens, spinach and some more salt. Combine everything well and let it cook for 3 to 4 minutes. Add heavy cream and cubed potatoes. Mix well and close the pressure cooker and cook for 20 minutes over medium heat without the cooker whistle on. Grind soaked cashew and poppy seeds to a smooth paste by adding some water. Turn off the stove after twenty minutes and let the pressure go down. Remove the lid. Again place the cooker over medium heat and add ground cashew poppy seeds paste and let it cook for 2 minutes. Remove from heat and transfer it to a serving bowl and garnish with chopped cilantro leaves. Perfect side dish for rotis… Looks yum and so colorful. This curry looks so tempting. Great clicks! I too make this saag but your method is different than mine. yours look so delicious. Going to try this soon. Perfect with Rotis.. Awesome clicks.. Tried this yesterday. 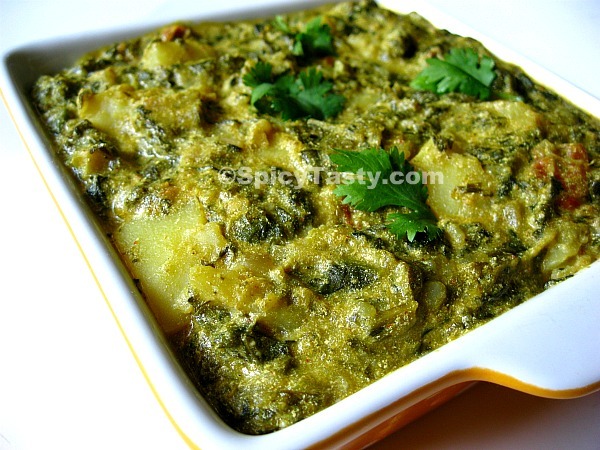 One of the best Sarson ka saag dishes we’ve ever tried. As suggested, used evaporated milk instead of cream. The milk lumped up a tiny bit (looked like grains of panir) after the first round in the cooker so I kept the potato chunks aside and pureed it slightly with a hand blender. The dish looked elegant and was thoroughly enjoyed by all. Nithu, thanks for this recipe. Indu, thanks for sharing this information with us. I am sure it will be useful for us and the readers.